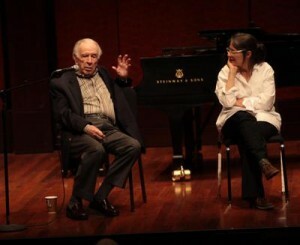 The eminent American composer Carlisle Floyd will be at the University of Cincinnati College-Conservatory of Music next week for master classes and workshops with students. And on Wednesday night in Patricia Corbett Theater, he will collaborate with pianist George Darden and CCM singers to explore some of the lesser-known repertoire of his canon. The free, non-ticketed event includes excerpts from “Cold Sassy Tree,” “Wuthering Heights,” Bilby’s Doll (1975), “Willie Stark,” and more. More than any other American composer, Floyd has told the story of the American experience in his operas. He found his subjects in rural Tennessee, the Central Valley in California and in Salem, Mass., and evoked American life with a musical language that is gripping and lyrical. Of his 12 operas, Floyd’s “Susannah” (1955), his first big success, and “Of Mice and Men” (1970) are among the top six most-performed American works, according to Opera America. And he is still writing: His “Cold Sassy Tree” was premiered at Houston Grand Opera in 2000. This entry was posted on November 17, 2010 by ccmopera. It was filed under Uncategorized .